Back row: left Miss Collegiate 2018 Emily Williams and on the right is Miss Farmington Fair Leslie Kaut. Front Row: is JR Miss Farmington Fair Leyani Robinson. 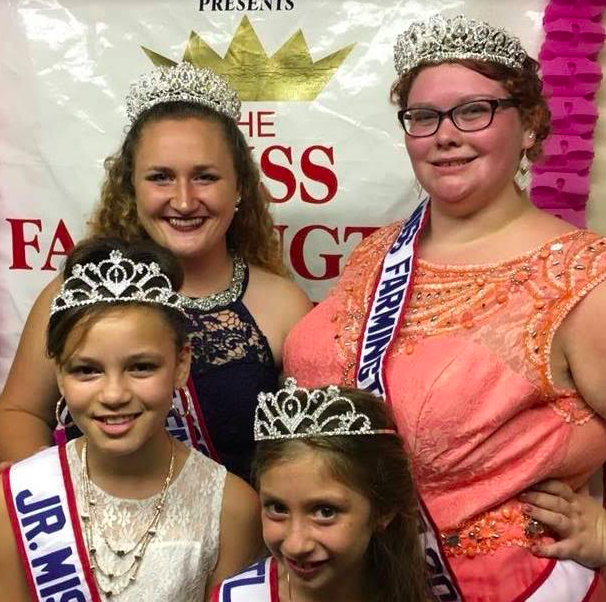 FARMINGTON - The 19th annual Miss Farmington Fair Pageant, was held on Sunday Sept. 16 at 6:30 p.m. at the Farmington Fair Grounds. Contestants arrived early for preparation, rehearsals, and interview competitions which all took place throughout the day. Young ladies who reside in Franklin County and the surrounding area, and are between the ages of 7 and 22, were welcomed to participate and compete for the titles of: Miss FF Collegiate (19-22) Miss Farmington Fair (15-18), Junior Miss Farmington Fair (11-14), Little Miss Farmington Fair (7-10) and Miss Hospitality, (for the young lady who is most active in participation in the fair itself) Prizes also awarded for each category of competition in each age group as well as essay, Miss Congeniality and runners-up prizes. A snack and pizza were provided to the girls during the day, courtesy of Ron’s Market and some Cash prizes were awarded from the Franklin County Agricultural Society. Contestants are annually judged in interview, talent, and formal presentation. The Miss Farmington Fair Pageant is not a beauty pageant. Next September the pageant will be celebrating its 20th anniversary.